Glass has always been a delicate material to work with, regardless of its application. Whether in architecture, design or sculptural work, its fragile structure has often been a limiting factor for the inventor. Although it allows the artist to play with light and create some astonishing pieces, the list of artists belonging to “glass users” is fairly short, and they mostly originate from the United States. However, for over three decades, the British artist Anna Dickinson has been creating exquisite vessels out of glass, using the material to her own advantage. Pushing its boundaries to their limit, she produced a myriad of sculptural work, playing with color and shape of the material. 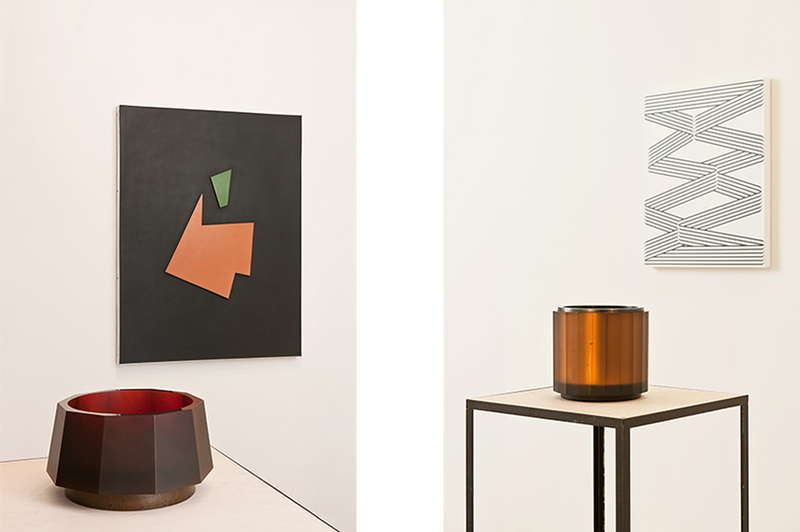 Presenting Anna Dickinson’s newest collection of work at von Bartha in Switzerland, her glass sculptures will be featured in conjunction with wall pieces made by fellow von Bartha artists. 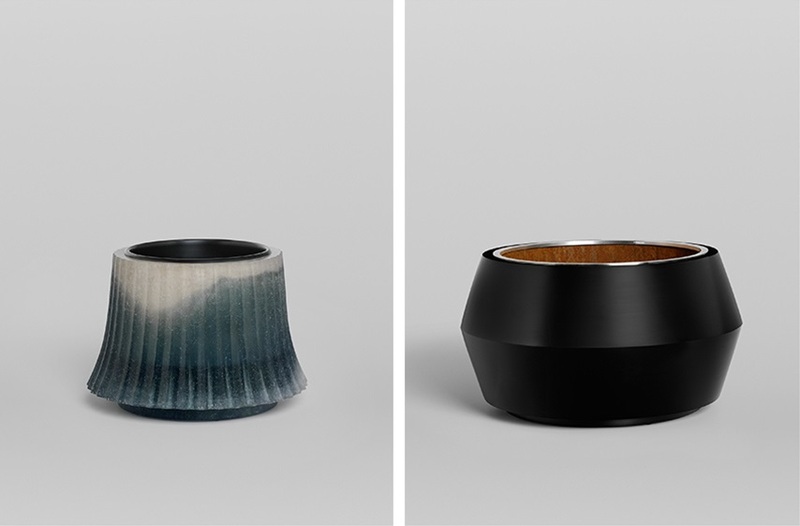 Left: Anna Dickinson – Blue Fluted Vessel, Blue and clear frit cast vessel with copper oxidised liner, 2014 / Right: Anna Dickinson – Black vessel with corten and silver, 2015. Photographs by Robert Hall, courtesy of von Bartha. The British artist Anna Dickinson, born in 1961, is known for her work that blurs the boundaries between glassware, ceramics and sculpture. Far from evoking a useful object, the small monumental vessels she creates are containers of more than just space – they hold emotions. “My works are containers, but they are containers of space, and containers of many other things – probably of emotions more than anything. Ultimately, it is up to each individual viewer to engage in the dialogue and to fill the seemingly empty vessel with his own feelings as he experiences and explores it.” Developing her practice and expanding it, she has used some unorthodox materials such as PVDF, Acetal and Fluoro Carbons in her works, maintaining glass as a common material and the center of each figure. Employing a great deal of effort in order to produce each piece, some taking several months or even years to make, she demonstrates her engineering skills and perfectionist temperament. 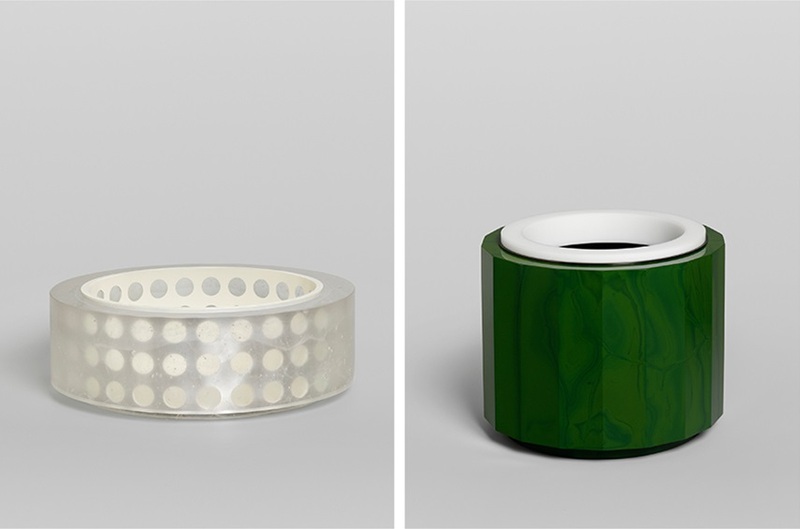 Left: Anna Dickinson – Clear Vessel with Perforated Aluminium Liner, 2015 / Right: Anna Dickinson, Green Faceted Vessel with White Rim, 2015. Photographs by Robert Hall, courtesy of von Bartha. With over three decades of working with glass experience, Anna Dickinson has developed her skill and attuned to the material to a point where she is able to push its limits and experiment while creating. Motivated by the “What if,” her curiosity leads her to compositions that embody both risk and determination. In combination with other elements, she gives glass a new meaning, transforming it from a delicate material into robust, dense objects that contradict our previous perceptions of its fragility. The play between glass and light is unavoidable, and she chooses opaque surfaces for her work in order to emphasize this quality. Void of superficiality, the dense objects she creates breathe with a mysterious, meditative essence leaving a lasting impact. Left: Anna Dickinson, installation view Glass Needs Space at von Bartha, 2010 / Right: Anna Dickinson, installation view Glass Needs Space at von Bartha, 2010. 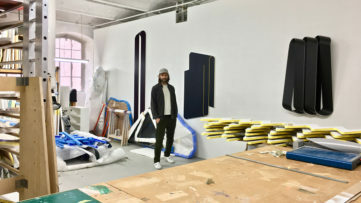 Photographs by Robert Hall, courtesy of von Bartha. Displaying her newest work bordering between glassware, ceramics and sculpture, Anna Dickinson once again puts decades of experience and craftsmanship on view. Using glass in conjunction with other elements, she creates objects with qualities unexpected of such a delicate material, masterfully pushing its limits and playing with light. Her sculptures are included in the V&A, The Fitzwilliam Museum and Corning Museum of Glass (USA) collections amongst others, and now viewers in S-chanf have a chance to see her latest work. The Anna Dickinson exhibition at von Bartha in S-chanf, Switzerland, will open on February 17th and last until February 27th, 2016. 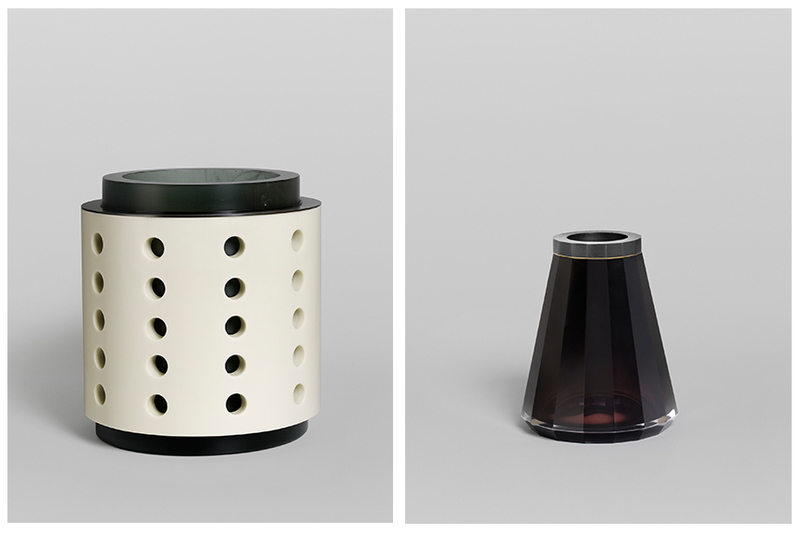 Featured image: Left: Anna Dickinson – Beige and Grey Vessel, 2015 / Right: Anna Dickinson – Black Faceted Vessel with Steel and Gold Plated rim, 2015. 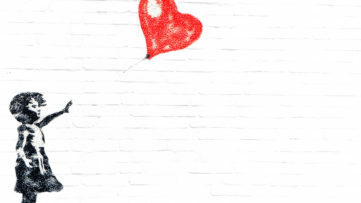 Images courtesy of von Bartha. 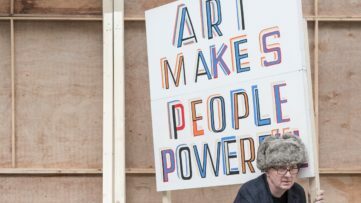 For Bob & Roberta Smith, The Whole World is an Art School!